When you’re 13 years old, picture day is a big deal. The annual school photo will freeze-frame who you were in your thirteenth year in a glossy eight-by-ten complete with seasonally appropriate background. Will the picture come out as perfectly as you hoped? Or will you find out you had a horribly awkward smile when the flash went off? Bella Thurston of Albuquerque, New Mexico, had perhaps even more reason to be happy about picture day. The 13-year-old was diagnosed with ependymona, a type of cancer that causes brain and spine tumors, when she was just five years old. Every school picture represents another year that she’s survived cancer. 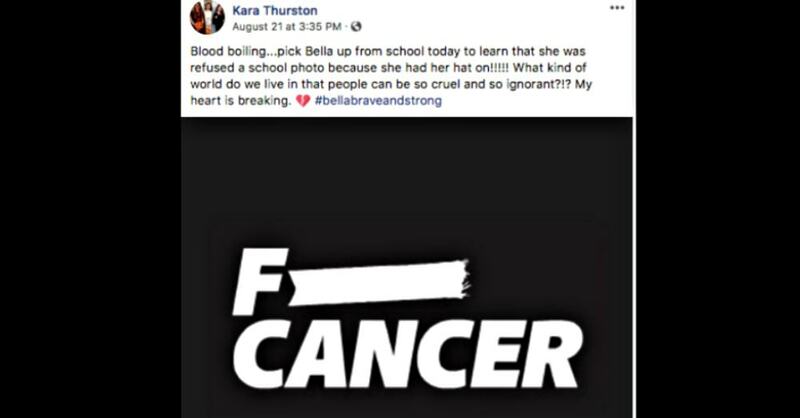 Maybe Bella could have explained the situation to the photographer, but she should not have to announce that she has cancer to random strangers just to get her picture taken, and it didn’t sound like the photographer was open to listening. Bella probably just wanted to get away after being told she couldn’t participate in picture day along with the rest of her classmates. “It was just really humiliating and upsetting for me. I was trying hard not to cry,” Bella said. Bella’s mom, Kara Thurston, was furious when she found out. “When something happens to your kid that you can’t fix, it’s heartbreaking, you feel helpless,” she said. Lifetouch Photography was contacted about the situation and they apologized and promised to adjust their training to allow for situations like Bella’s. They’ve also offered Bella a complimentary photoshoot in a place of her choosing, but Bella isn’t interested. “I would not like to be singled out, I would like my picture to be taken the normal way and to be in the same spot that it always is in the yearbook,” she said. Bella’s request seems more than reasonable. We hope that the photographers will be better trained and ready to take everyone’s picture going forward, even if some kids need something a little different to make them feel comfortable. Kid Wears Green Shirt To Picture Day, Mom Sees Photos & Dies Laughing: Click “Next” below! Katie Taylor started writing in 5th grade and hasn’t stopped since. Her favorite place to pen a phrase is in front of her fireplace with a cup of tea, but she’s been known to write in parking lots on the backs of old receipts if necessary. She and her husband live cozily in the Pacific Northwest enjoying rainy days and Netflix. CANCER JULIO 2018. (SEGUNDA QUINCENA).